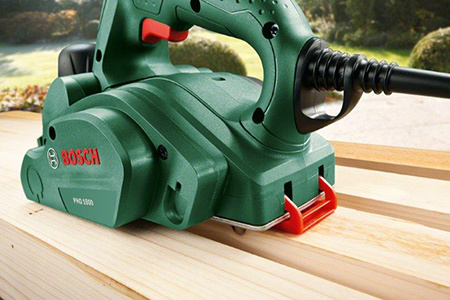 Thanks to the Bosch PHO electric planer, it's possible to carry out wood and board project with greater precision and faster turnaround times. The Bosch PHO offers easy and effortless planning and high surface quality. 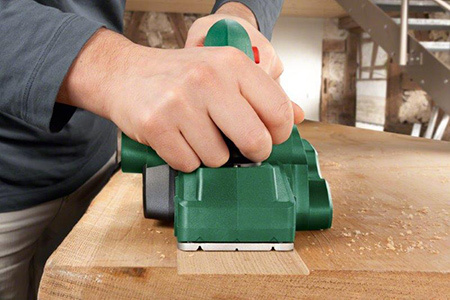 The electronically-balanced drum of the Bosch PHO 1500 electric planer provides for fast and smooth cuts, resulting in improved precision and efficiency. Being able to plane (trim) timber or board saves you time and money. Rather than spend hours and hours - and use excess sanding discs - to remove excess surface areas, Bosch PHO Planers offer the best solution. The Bosch range of Planers offer fast, precise removal and large planing width, to cut down on time spent trimming. Ideal for demanding applications up to a cutting depth of 1.5 mm. The chip-clearance blower prevents chip congestion, allowing the user to work without interruption. The blower can also be connected to a dust bag or vacuum cleaner. Tungsten carbide blades that are 10-percent sharper than hard metal extend the lifetime of the blades by more than 30-percent. The cutting-depth adjustment handle ensures precision and secure guidance of the tool while the powerful 550W motor makes planing considerably easier and faster. As a result, absolutely flat surfaces and precisely chamfered corners can be achieved with zero effort. Hex key for changing the blades is securely and conveniently stored in the key depot on the planer. This means that blades can be changed without undue interruption of the workflow. The Bosch PHO is suitable for both left- and right-handed users. 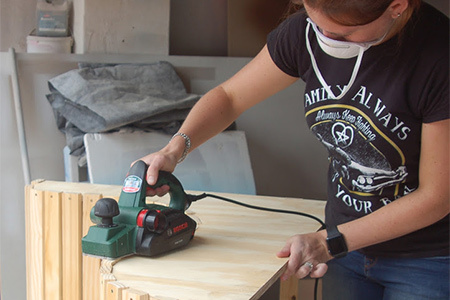 Automatically parking rest prevents damage to the workpiece or planer blade when putting the planer down. The Bosch PHO has integrated V-grooves that are ideal for applications such as fitting a window or door, or planing the collar beams on a roof truss. Even extensive projects can be achieved reliably, as the PHO 1500 extends the functionality of the planer beyond the traditional woodworking tool. Entire rebates are also easy to make due to the rebating depth of 8 mm and a maximum planning width of 82 mm. 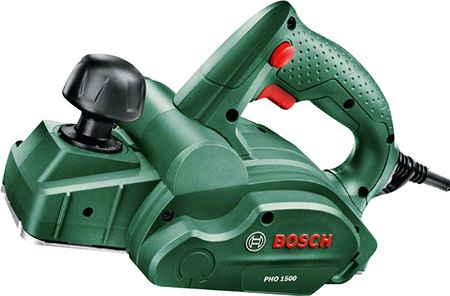 The Bosch PHO 1500 electric planer can even be used to remove coatings such as varnish.